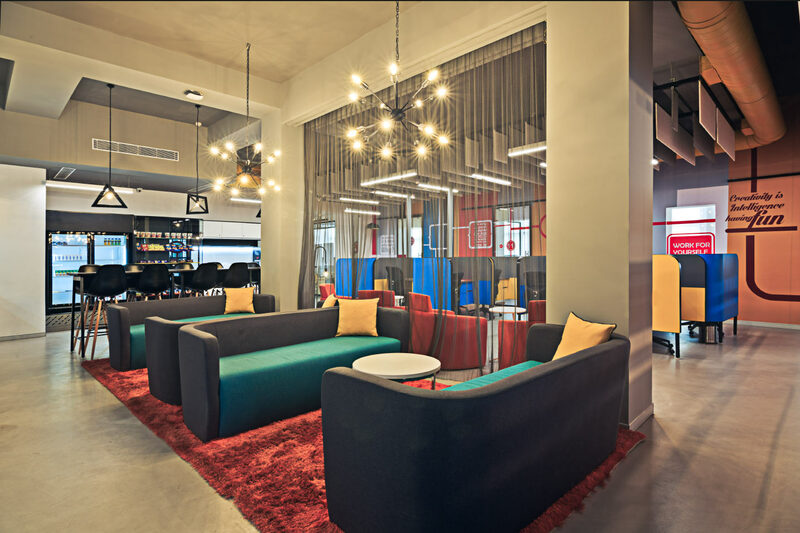 WeWork’s co-working space in Bengaluru. The company also has shared office spaces in Mumbai and Gurugram and half of its 10,000-plus occupants are blue-chip companies Enter WeWork’s premises at Bandra-Kurla Complex (BKC)—a 16-storey building in Mumbai’s central business district—and a chic vibe immediately catches on. Music streamed from the co-working company’s headquarters in New York plays, a café offers up easy seating and a place to hang out, and MacBook-rearing millennials who’ve swapped suits for jeans mill about. “All WeWork locations have the same music playing at any given time,” Karan Virwani, director of WeWork India, tells Forbes India. “It’s part of the culture we want to permeate.” It is this cool culture that has attracted startups and freelancers to co-working spaces aside from the more prosaic reasons of affordability and flexibility. And now, increasingly, larger corporates are eyeing a piece of the shared workspace future. Globally, WeWork has seen its “enterprise member” profile—the term they use for large companies—jump from 2 percent in 2015 to 40 percent today, says Virwani, scion of property developer Embassy Group that brought WeWork to India in late 2016. Here too, at WeWork’s six locations spread across Mumbai, Bengaluru and Gurugram, 50 percent of its 10,000-plus occupants are startups and freelancers, while the rest are blue-chip companies, including Microsoft India, Discovery Channel and Twitter India. For them, it’s not so much about cost-effectiveness—WeWork at BKC charges ₹18,000 a month for a ‘hot desk’, where no one seat is assigned to a single person, ₹25,000 for a dedicated desk in an open area and ₹40,200 a desk at a space marked out for the company. Shared workspaces do away with the upfront security deposits and fixed period leases that traditional landlords typically lock tenants into. Yet, large companies can easily afford their own spaces at premier business hubs like BKC. So the appeal for them lies in mingling with energetic entrepreneurs and having a bit of that ‘startup culture’ rub off on their own operations. Take the case of Jaguar Land Rover (JLR), which has a 10-person team stationed at a glass-doored space at WeWork, BKC. Sitting amidst graphic designers, startup founders and even non-profits, the company sees synergies in being surrounded by people who “think differently”, says Sameer Arif, who oversees the team’s benchmarking activities against those of JLR’s competitors in multiple markets. They chose not to sit at JLR’s Mumbai headquarters in Ceejay House, Worli, for “strategic reasons”, he says, adding that sitting out of WeWork gives his colleagues the ability to “interact with others from different industries, make friends and grow their professional and personal networks”. All this not just through everyday water-cooler conversations, but also through the events that WeWork carefully curates such as misal pav breakfast gatherings, Zumba classes and talks by individuals whom the member-community is keen to listen to. Not to mention free beer on tap every evening. Ditto for Sharekhan. A subsidiary of BNP Paribas, the French multinational bank that acquired the Mumbai-based retail brokerage in late 2016, Sharekhan’s 100-person team sits out of co-working space Awfis in BKC—a stone’s throw away from BNP’s Mumbai headquarters. “We could have chosen to sit there [the headquarters] or any of our other offices in Mumbai,” says Varun Sridhar, director, Sharekhan. “It’s not normal for a big company like ours to do this, but we’re working on a special new project and needed a startup-like environment.” In fact, instead of opting for a dedicated space at Awfis, like most mid- and large-sized corporations have, Sridhar chose to hot-desk. So his employees sit at a different workstation amidst different people, every day. “What’s the point of co-working if you isolate yourself?” he asks. Flexibility is also important, points out Amit Ramani, CEO of Sequoia-backed Awfis that went from 3,000 members across 17 centres last year to now boasting over 12,000 members sitting in 50 centres pan India. More than 70 percent of Awfis’s clients are medium- and large-sized companies that are able to easily expand into new areas, set up satellite offices away from their headquarters or even downsize operations if needed. For instance, Zomato set up a base in Kolkata, away from its Delhi headquarters, in a matter of days through an Awfis centre. So also Vodafone, which took up 380 seats for its shared services team in Awfis’s Pune facility. As large companies look to target tier II markets with their products and services, Awfis hopes to be able to meet their needs by setting up centres in cities like Chandigarh and Kochi. For companies too, as they outsource their office management to co-working operators, they are able to focus on their core competencies. Says PC Musthafa, CEO and co-founder of iD Fresh Food, a ₹150-crore, ready-to-cook packaged food company, “Before moving into The Hive, we used to work out of our own office [in Whitefield, Bengaluru]. If there was any issue like a faulty printer or a toilet flush that didn’t work, people would come to me, so I started getting involved in all of that,” he says half-jokingly, half-exasperatedly. Since moving 35 of his 1,600-person strong team into The Hive Collaborative Workspace at VR Bengaluru, one of the southern city’s largest shopping malls, he’s been able to focus undividedly on his business, he says. Another reason why established companies take to co-working is to attract and retain employees, particularly millennials, who are touted to form 64 percent of India’s workforce by 2020, according to Deloitte. And companies are gearing up for that. So much so that human resource managers are getting involved in real estate strategy decisions, unlike previously where only the CFO was in charge, says Virwani. “Millennials prefer to work for companies that share their vision for the future. The lines between social and work life are blurring, so it’s important for employers to give their employees an enriching environment to work in,” he says. Shared working spaces help firms cut corners on expenses as well as build sustainable networks. Classified ads portal OLX has a four-member sales team operating out of Mumbai’s business district of Lower Parel. The company pays a rent of Rs 48,000 to Rs 50,000 per month for the work space, averaging about Rs 12,000 per person. For the premium piece of real estate that Lower Parel is, OLX would typically have had to pay anywhere between Rs 12,000 to Rs 18,000 per month for one workstation (of approximately 100 square feet) plus a security deposit equivalent to six to 12 months’ rent. The expenses would have further shot up in conventional leasing as landlords don’t offer floor plates less than 1,000 to 1,200 square feet, no matter how small the team. So, how has OLX gotten off this easy? 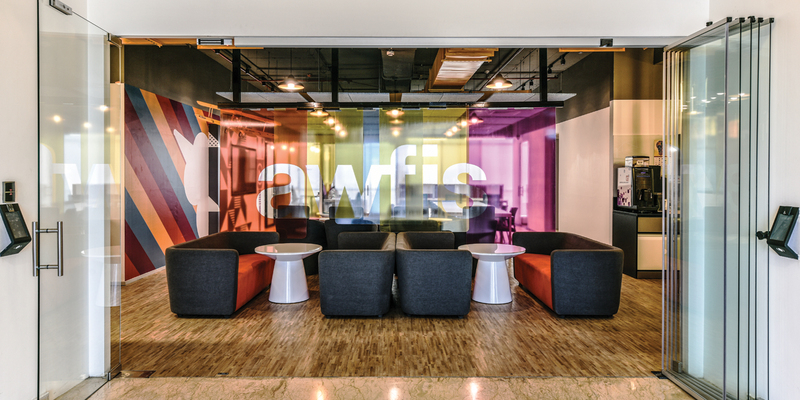 Because it is merely one of the many companies that shares Awfis, a two-storied co-working space that allows offices to enjoy a top location, and a range of amenities without having to pay through their noses. According to Amit Ramani, founder and CEO of Awfis, a prominent player on the scene, of the total 500 million sq ft of commercial Grade A and Grade B space in India, co-working and business centres comprise 0.4 to 0.5 percent. Over the next three years, he expects this to grow to about 2 percent. Meanwhile, proponents of the co-working craze believe that this is a “mega-trend”, as Anand Lunia, founder of early stage venture fund India Quotient, puts it. For startups in need of flexibility, the long leases and large floor plates offered by traditional landlords are impractical. “Startups or SMEs don’t think in square feet. They think in terms of desks. If they have five people, they need five desks. 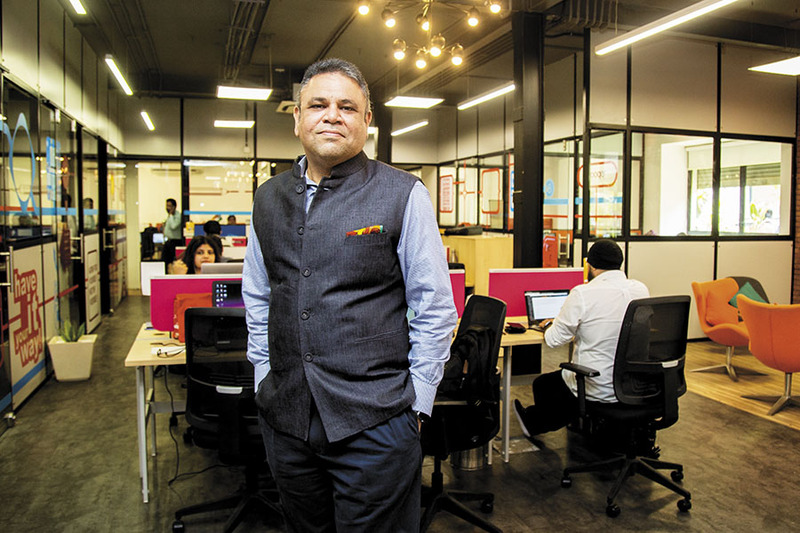 If they grow or shrink their business, we can easily adapt to their requirements,” says Ramani, who boasts of hosting over 220 companies in 20 Awfis centres spread across seven cities. Larger companies looking for temporary space also see merit in co-working spaces. As do an increasing number of multi-national companies like consulting firm Accenture, that Awfis counts as a client, or the Boston Consulting Group, that works out of a CoWrks facility in Bengaluru. The desire to adopt a “startup-like culture” and thereby foster innovation is a key driver, points out Nair.